Summer can be a time for indulgences which unfortunately is not the best time for your oral hygiene. With the heat of summer, it’s common for many people to drink cold beverages and eat ice cream as well as being out in the sun. We want to provide a few tips to enjoy the benefits of the good weather without having to worry about your next dental visit. Your Teeth Are Not Tools! Your teeth are designed as the initial digestion method of your body and are used to break down food for your stomach. Many people feel that their teeth can substitute for tools and use them to open bottles, wrappers, and chew ice. Some of these habits can harm your teeth and can be costly to repair. So remember to only use your teeth for their intended purposes and not as tools. When playing sports in the summer, even if they are not contact sports, it is a good idea to wear proper protection. Your teeth can be easily protected by wearing a mouth guard during your sports activities. Come in and see us at Dental Health Group and we can provide you with a custom mouth guard that will protect your teeth this summer. Remember that while enjoying a refreshing cool snack such as ice cream, slushies, sodas, freezies, there is just a few things to remember as some of these snacks may not be the best for your oral health. Also, learn how you can help offset the damage. Dairy products, like ice cream, can be a good source of calcium. Unfortunately, most ice creams are made with lots of sugar, one of the leading causes of tooth decay. When buying ice cream, we suggest buying sugar-free or low-sugar ice cream. However, if your child wants regular ice cream, there are a few ways to minimize the impact the sugar has on the teeth. Brush teeth after eating ice cream or rinse with water or mouth wash. This will help get some of the sticky sugars off the enamel. Eat ice cream at the end of a meal. Are sodas bad for my teeth? Yes, they are! The acids in sodas start to eat away at the enamel on your teeth only 20 minutes after your first drink. Plus, the extra calories provide no nutritional value. We recommend ddrinking water to quench your thirst on the hot days. Even if you remember to wear sunscreen on your face and body when spending time outdoors, you may forget about your lips. Your lips are more susceptible to burning than most parts of your body, yet many people don’t think about protecting them from the sun. A quick application of lip balm will go a long way in protecting the lips from the sun’s harmful rays. Remember, summer time is a time to enjoy. We hope these simple tips will remind you to maintain good oral health practices! Taking your child to the dentist doesn’t have to mean an unpleasant experience. Showing them that going for a dental checkup can actually be fun is easier than you might think. Starting early makes a big difference. It is best that your child’s idea of going to the dentist is a relaxing, positive thing, rather than something that means being in discomfort and pain. You can accomplish this with early routine dental visits. By starting early, your child can get used to going to the dentist without having a lot of anxiety about the process. It will also establish trust between the child and the dentist early. Even though they don’t have their permanent teeth yet, a dentist can get a good idea of how your child’s permanent teeth are growing and coming in. Addressing early issues such as bottle mouth or early cavities, for example, can help prevent these issues from extending after the first 20 baby teeth fall out and permanent teeth start to come in. Parents can also help by educating their children about why going to the dentist is so important. There are many wonderful children’s books about the first trip to the dentist. Reading time can serve to reassure your child that going to the dentist is not only something that has to be done but can actually be fun. Explaining what will be happening during reading time help them to feel less anxious. It’s best to focus on how the dentist will help their teeth, rather than telling them about what can go wrong with their teeth if they don’t go. To make the first visits as non-threating as possible the decor and the overall feel of the office will be geared toward making children feel comfortable. Dentists also use tricks like offering movies to watch or giving them a video game to play that they can look at on the ceiling while they are examined. These kinds of distractions can take their minds off of something that they might have been nervous about. Finally, most dentists also offer some sort of prize or treat for a visit to further establish trust and help your child enjoy their visit. Regular visits to the dentist are important not just to your child’s dental health but also to their overall well-being. Establishing a good relationship with a dentist early on will ensure your child develops good oral hygiene from the beginning, potentially saving them from costly procedures down the line. You should begin cleaning your baby’s teeth as soon as the first teeth erupt. Using gauze or a damp washcloth you should gently wipe the surface of the teeth and gums. 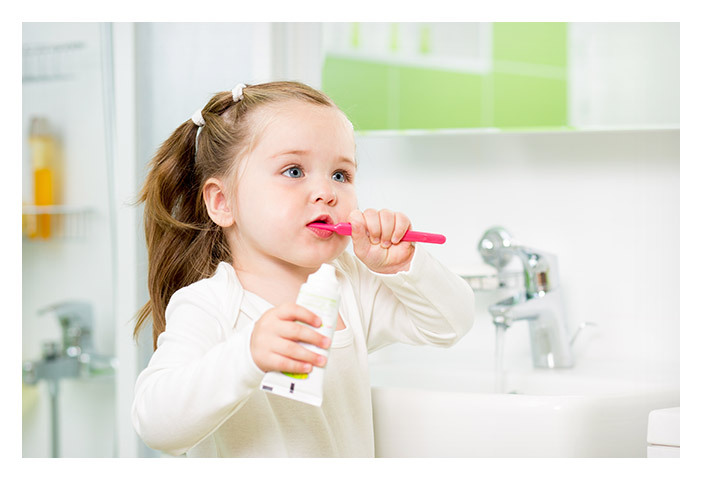 You can help your child to learn proper brushing techniques by doing it with them every bedtime until they can properly handle the brushing and flossing themselves. A very small amount, about the size of a small pea is more than adequate. Children tend to swallow a fair amount of the toothpaste and, over time, this can cause white spots to form on permanent teeth due to the excess of fluoride.